Is Apple Really That Environmentally Unfriendly? You hit the nail on the head with your writings on Eudora [Odysseus Cometh: The Real Successor to Eudora and Why Eudora Fans Are 'Doggedly Faithful']. My current employer forced most of the users away from Eudora years ago, but there are still a few die-hards here (including myself) struggling to make it work in an IMAP environment. One client has several hundred filters, two others have over 900 mailboxes each (one stores them locally [speed!] and the other on the IMAP server [accessibility]). The setup that I came up with after our employer turned off POP packets on 6/30/07 (not just the servers - the packets on the network too) is to keep the POP account as <dominant>, but set it to not check mail, and create an IMAP personality. Two simple filters move mail to and from the POP and IMAP sides - all mail is scanned for "@" and copied to either the In mailbox (local) or the Sent Message (IMAP). That way anything sent from Eudora is saved on the IMAP server and anything received is saved in the fast-search local folder and the <dominant> account mailboxes are easier to work through. But I'm experiencing a new problem with my copy of Eudora v6.2.3 (missed the window for buying the 6.2.4 license) on Leopard (current updates) on my MacBook Pro - corruption of the Eudora Nicknames file. All is well for a while, but then Eudora hits me with a dialog box when it opens, that an email address is either too long or otherwise malformed. It then repeats this dialog a few seconds later. Couldn't find the problem address, but after a while I noticed that the contents of the fields in the Address Book were being deleted or scrambled. It eventually got to the point that I replaced the entire Nicknames file with an older version that was backed up on a G4. Why would Eudora scramble or delete items from what is really a tab-delimited text file, but only on an Intel Mac running Leopard? I was searching for a solution when I found your article. Thanks for what you're doing and hopefully we'll all be thrilled by Odysseus. Thankfully I haven't yet run into any file corruption issues using Eudora 6.2.4 with Leopard, but TidBITS' Adam Engst has and wrote about it in How to Fix Corrupt Eudora Mailboxes. Probably worth a look in relation to your problem. I'm still using the ad-supported version of Eudora 6.2.4, which works reasonably well, and the little ad window just stayed blank for several months and doesn't show up at all these days. I felt like a big chunk of the world had dropped out from under me just a bit ago. I was grieving as though a world catastrophe had occurred! I waited until today to attempt to phone Technical Support at Qualcomm, to help me coordinate the installation of Eudora 6.2.5.6 (later versions were fighting with Zone Alarm) in my just acquired used Dell laptop, since I wasn't getting things to work correctly after I set up the first two mail folders in Eudora as I'd installed it last week. The other day I'd found an online FAQ telling me how to install over and in the directory where XP apparently now insists one put all the data files. But I find no help to retrieve the original few folders and emails that had come in since I first installed them to the directory of my choice (no long paths for me)! Attempting to find a phone number for Tech Support, I roamed all over their pages and found none! In phoning a number I still had for a gal in Qualcomm sales from 2006, I got a recording informing me that Qualcomm no longer sells, supports (or anything) for Eudora. Whoa! I still have a few paid support calls left to me, but no one is going to honor them now! And here I was being so stingy with my calls - only calling when I could fix my problem no other way! So, I Googled and found your Ramblings. Well, I recall seeing something on Mozilla's site a while ago about their teaming up on a Eudora combo, as I now see your reminder online from yesterday. You are a Mac fan; and I guess many of us should be, but doubtful we'll switch over at this stage of the game! Too many things aren't written for the Mac. And I'm still married to my Ami Pro word processor! What can you tell me about what we PC fans are going to have available to us? Should we just hang in here for a bit and see what Odysseus does? My ignorance of PC applications is fairly encyclopedic, but both the Open Source "Eudora" being developed at Mozilla.org and the new Odysseus application will be cross-platform, and both so will work on your Dell. I'm afraid I can't be much help with your technical issue. Eudora installation on Macs is generally a slick and painless procedure. You just run the installer, configure your accounts in the Settings, and you're good to go. I've used Eudora on Macs since I first got online and have never had any occasion to call tech support. Like most things on the Mac, it "just works" - or did before OS X 10.5 Leopard partially broke it and Qualcomm terminated development of the program. You might be surprised at the variety of software that is written for the Mac. No Ami Pro, but an amazingly fine little word processor called TextEdit comes bundled with OS X. It supports styles, has inline spell checking and grammar checking, does HTML conversions, and can even open and save MS Word documents. And, of course, Intel-based Macs can run Windows natively, so you can have your cake and eat it too, so to speak. 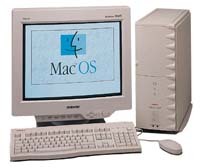 I have this fine old G3 Beige Minitower (366 MHz) which I want to fine-tune with as many of the old Classic Mac OS apps as possible, however, that said, I want to plan on an effective backup program just in case. Do you recommend installation of a PCI card to allow USB/FireWire backups to say an external FireWire or USB hard drive? Currently, I'm backing up onto 100 MB Zip disks, which is not all that satisfactory but acceptable. What equipment would I need to acquire in order to burn CDs using installed Mac OS 9.2.2? I'm thinking external CD burner. SCSI? I have no more than about $100 I would want to invest in a backup solution. I do possess a FireWire Iomega Zip drive and a SmartDisk external FireWire HD I've used with G4 Macs, still in use, thus my first question. Any leads or advice on how to set up the old Beige Minitower would be appreciated. Yes, absolutely I would recommend installing PCI USB and FireWire cards in your beige G3. I have both in my old Umax SuperMac S900 (200 MHz 604e) tower running OS 9, and they work great, including with an external FireWire CD-burner. Not much setup required. It all just worked for me. OS 9.2.2 has both USB and FireWire support built-in. Individual peripheral devices may or may not require proprietary drivers. My daughter also has an S900 with PCI FireWire and USB support, as well as a 350 MHz G3 processor upgrade. It all works fine. A friend of mine, who stuck with his Performa 6500 for a long time into the PowerPC era, used a combination FireWire/USB PCI card with excellent results as well. This stuff should all be available used at reasonable prices, and I'm a big fan of using external hard drives for backup. I read the latest 'Book Review with interest [editor's note: actually a year-old column], not least the section about Greenpeace's complaints about Apple's environmental policy. Working in the chemical industry myself, and with a degree of responsibility for waste disposal, I take their points on product composition. I work in a different area, so I'm not sure what the cost/benefit impacts of replacing PVC and BFRs are. On the other hand, I think it ignores a fairly important. No computer, from any manufacturer, made much before 2003-2004 will have been made with much regard to environmental friendliness. On that basis, there's a whole swathe of legacy hardware heading to landfill which has never, and will never, meet any of the Greenpeace requirements. Which is where Apple's big advantage comes in. Macs just don't die. They could be packed with depleted uranium, red lead, and DDT, but if they don't go to the dump, it doesn't matter. The two Macs on my desk at the moment have a combined age of about 11 years, and they're both still going strong, doing everything I need. And I know I'm far from being the only person in this position. I don't pretend to know what the proportions are, but I'm willing to bet that the ratio of Apple to PC equipment in the tip is far lower than the installed base figures would suggest. Alright, fine, it won't do Apple any harm to make their products more biodegradable. After all, they will die, one day. But it'll be a trickle, instead of the wholesale PC flood. Thanks for the comment. Good point about the relative longevity of Macs as opposed to PCs. I still have every Mac I've ever owned, dating back to a 1988 Mac Plus, and they all still work. I even have two 2000 vintage Pismo PowerBooks in workaday production use running OS X 10.4.11 Tiger very nicely. I'm personally afflicted with a syndrome referred to as Multiple Chemical Sensitivity (MCS), in which one suffers reactions to environmental exposure to concentrations of many chemical substances that are hundreds or perhaps thousands of times lower than generally accepted toxicity thresholds, which makes one's relationship with computers a bittersweet affair to say the least, since computers contain a lot of plastics, and plastics tend to gas off chemical vapors - especially when the machine is new or gets hot. One hoped-for collateral benefit of the push to "greener" computers for us MCS folks is possibly less-noxiousness.